We stayed here last night outside of Dixon. Enjoyed the Vacaville heat and the cool steady breeze coming from somewhere. Short day but an enjoyable one with the mules. Making our way to San Francisco to bring the message / energy to City Hall that there must be a trail system in this state and country going north south east and west passed by congress with federal funding and the same effort used to build the interstate freeway system. The Mules belong to and carry the collective energy of millions of Buffalos, Elk, Deer, Salmon, Lions the magic and power of life that energy will be spread through the streets and buildings of San Francisco. Please support the Mules by signing this petition to The White House to implement a national multi-use trail system. On July 16 2014, the Mules attended arraignment at United States District Court in Los Angeles for the three citations received on May 9, 2014 while spending the night on land under jurisdiction of the Santa Monica Mountains National Recreation Area. A “not guilty” plea was entered and trial date is set for November 6, 2014 at which time the Mules will return to Los Angeles. Below are the documents that were handed to us in court. Mule was cited on May 29, 2014, in San Luis Obispo, California under Penal Code 647 (e). The Mules delivered a handwritten letter to the court requesting an extension of the court hearing until December so that they could migrate north for the summer and return during cooler weather. On July 8, the Mules were given an extension for court arraignment to Dec.11. On July 10, the Mules received a notification from the Office of the District Attorneys that charges would not be filed at this time. On January 15, 2015, Superior Court Judge signed a court order to officially dismiss this case. On May 9, 2014 about 6pm, we were looking for a place to stop as we had been walking all day. We came across this open area. We went into it. There weren’t any locked gates or signs forbidding us to go into it, so we did. I removed the gear from the mules, turned one loose and put one on a picket line attached to a tree. I fixed my dinner and switched the mules, brought one in, put one out and went to sleep for the night. We were awoken about 10pm with flashlights shining on us. National Park rangers announced who they were and wanted to know what we were doing there. We told them that we were walking all day, stopped for the night and would be leaving in the morning. They checked with their supervisors who responded no deal. You have to leave. We said that it’s 10:00 at night, we aren’t interested in packing up and walking in the dark. We are on national park land. This is public property and belongs to the people of the United States. We believe that we have the right to stay here for the night to rest and will be gone in the morning. The supervisors back at the station said that we had to leave or be taken to jail. So I was taken to the Alhambra City Jail and the mules were taken to the Ventura animal shelter. I entered the jail around 12:00 at night. I was put in a large cell by myself. I went to sleep. I woke up around 6am and started walking back and forth in my cell for 6-7 hours at which time lunch came in and I ate it. Then I went to sleep again. I was asleep for about an hour when a jailer came in and said get your stuff, you’re leaving. So I got my stuff and walked out to the corridor and the park rangers were waiting. They took me back to the animal shelter where my belongings and the mules were waiting. I packed the mules up and we left there sometime after dark and we were on our way. So, in summary, we were arrested by National Park Police by Thousand Oaks for merely stopping to rest for the night on public land that belongs to the people of the United States in an area that wasn’t manicured. It was an open field that we could do no harm. The Mules were arrested on southbound Highway 101 near Gilroy. The Mules were told that we were unsafe, get off or be arrested and we were arrested. Safety is being used as a smoke screen to disguise the real reason we were arrested. The real reason is to make these public right of ways for the exclusive use of the automobile, the suburban model of getting around. All other venues of usage are to be gotten rid of. The declaration of safety is the mechanism by which the Megatropolis and this enforcement agency, the CHP, has decided to go forth with to get the job done. We are as safe as anybody could be under those circumstances. It’s not our fault that the state of California is allowing these automobiles to move at these horrendous speeds. These speeds are killing people, maiming people, it goes on all day every day. The insurance rates are outrageous and very well understand the chances are that when you get into these automobiles with your children, your families, you’re going to turn into a bucket of blood. It happens every day, all day. These automobiles are not safe. We move at 2-3 miles per hour. We’re not going to hurt anybody. We never have. We don’t deal out death and destruction as we go along. The automobile does. We are not going to give up our right to move freely in this country. These public thoroughfares are all that is left. There is no other mechanism to express your right to freedom to move that body of yours from one place to the next when you choose how you choose. When that’s gone, that’s the bone of freedom you don’t have any freedom. We are not going to give it up. Our way of life depends on moving, living with our surroundings, the trees, the grass, the brush, the insects, the animals, with a meaningful relationship, reacting to these forces all day long with our feet on the ground surrounded by that energy. We have to have the right to do that using the public thoroughfare. We’re not going to give up that right. When the Megatropolis tries to disguise its real purpose using safety as the mechanism, it’s real purpose is to remove all other venues other than the automobile from the public right of way. It’s to get rid of us, there is no question about it. That’s the end result as we have reported of our arrest in Gilroy. The end result is jail. They put us in jail and then they tried to commit us to a mental institution, a mental hospital for involuntary treatment, force feed us drugs, destroy our minds, destroy our ability to get back out and walk all day every day. That was attempted. Make no mistake about it, we know what was attempted. We are going to harp on this subject, talk about it. We’re not going to let it go. Judge Jerome Nadler who dismissed the case based on arrest being invalid. Citation was for “disobeying the lawful order of a peace officer” when Mule refused to leave the highway. The judge determined that the Mules had a legal right to be on the highway and therefore could not be ordered to leave. A 65-year-old man was arrested just south of the Butler Bridge on Wednesday after allegedly walking three, fully-packed mules on the fast-lane shoulder of Highway 29, the California Highway Patrol reported. Wednesday afternoon, authorities responded to reports that a man was walking mules on the northbound shoulder of Highway 29 toward the Butler Bridge, which has no shoulder, the CHP said. When officers arrived, the man allegedly became irate and was arrested on suspicion of resisting arrest, a misdemeanor, and not obeying traffic signs, an infraction. John Sears was booked into the Napa jail at 3:30 p.m. on the charges, according to the booking report. A city of residence was not listed for the suspect, only California. 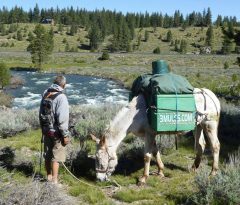 According to the website, Sears and his three mules, which appear to travel in a line, have been walking for nearly three decades and have traveled three states. In 2012, the group was cited for illegal camping, according to the website. The CHP said it is illegal for pedestrians and their pets to walk on a highway. The animals were in the care of animal control Wednesday afternoon.